I love tuna, but I don’t cook it often. And being in the desert fresh fish isn’t, well, as fresh as it could be. But one of the local supermarkets has a nice selection of frozen seafood that is about as fresh as we’re going to get in Be’er Sheva (Union Square fish market, how I miss you). 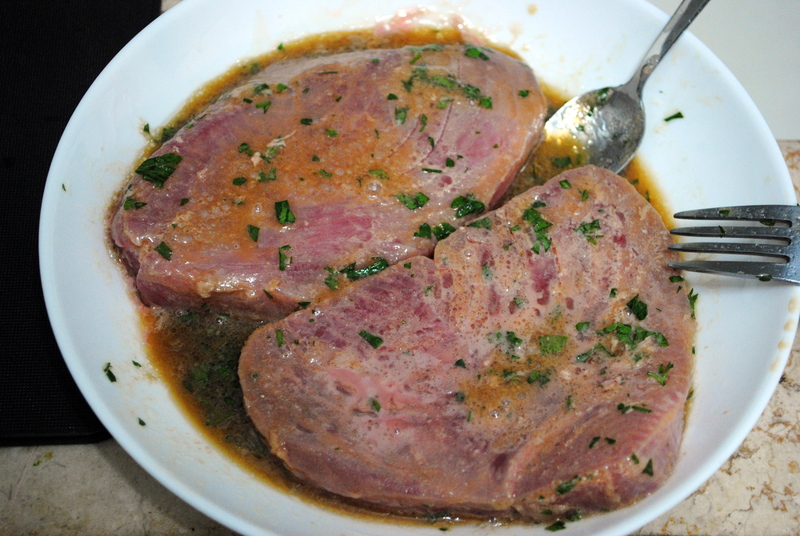 I wanted to flavor the tuna without turning it into a ceviche so I quickly marinated it in a mixture of soy sauce, lemon juice, garlic, and parsley. 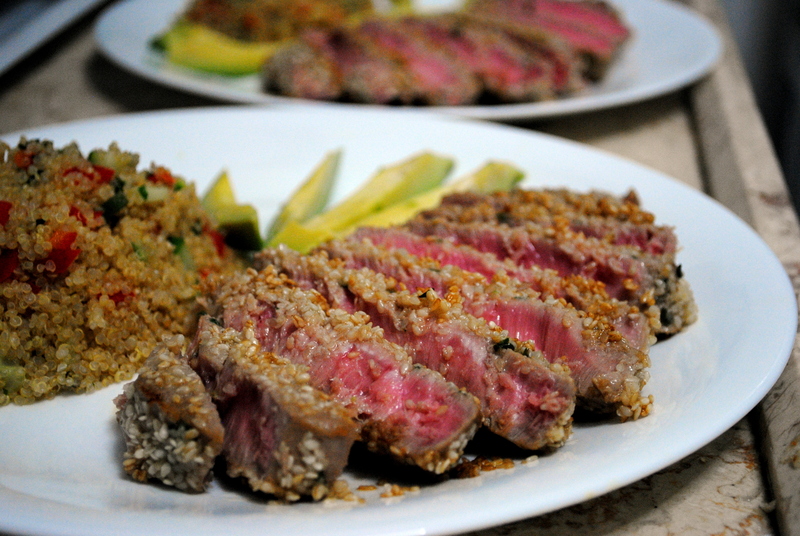 A coating of sesame seeds and a quick sear over high heat finished the dish. Any number of sides would round out the meal but I went for a healthy quinoa salad and slices of avocado. Combine the soy sauce, lemon juice, parsley, and garlic in a wide, shallow bowl. Add the tuna steaks and flip to cover completely in marinade. After 15 minutes, remove the tuna from the marinade and coat both sides in sesame seeds. Heat the oil in a pan over moderately high heat. Add the tuna and cook, flipping once, until the sesame seeds are lightly browned and the tuna is medium-rare, about 5 minutes. 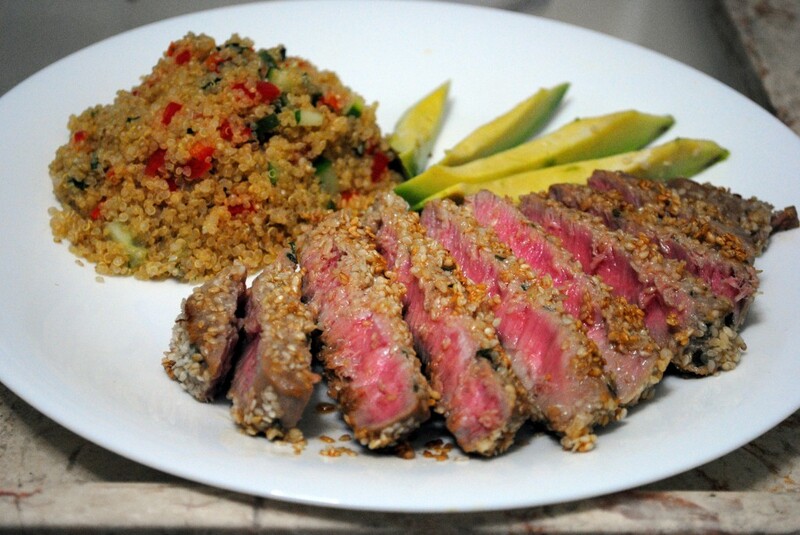 Serve with sliced avocado. Pat the tuna dry and then add sesame seeds? I didn’t pat it dry; I thought maybe the liquid would help the sesame seeds stick. You can also skip the marinade and just coat the tuna in sesame seeds. Hot DAMN that looks diggity delicious.